On entering the 3rd High-Level Assembly of the Carbon Pricing Leadership Coalition, I was asked by someone situating diplomats which country I represent. I would be at the table to represent 90,000 citizen volunteers across 42 countries — the Citizens’ Climate Lobby — and was fortunate to be supported by two colleagues, one a leading member of our staff, the other a superstar volunteer. 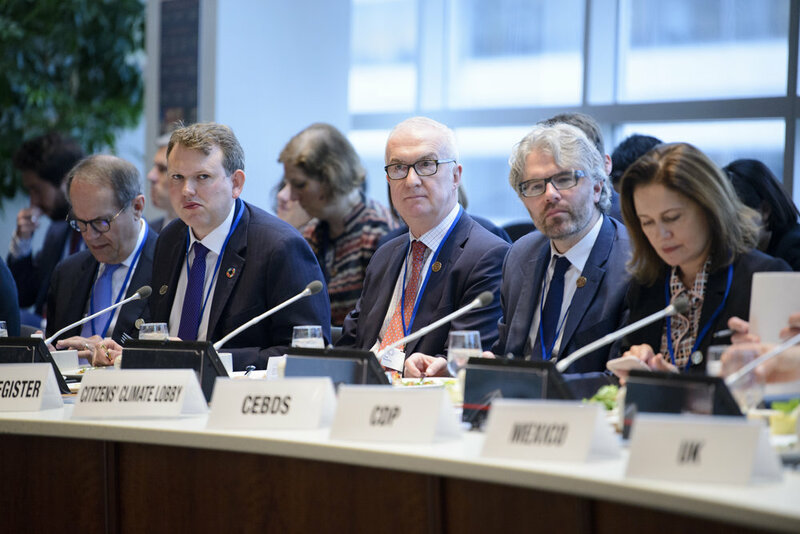 Our experience illustrates the transformational innovation of this multilevel, multilateral coalition: non-governmental organizations, governments, UN agencies, businesses, banks, and universities, come together around one table, and work as peers to design and to facilitate the deployment of smart carbon pricing, across the world. Such multilevel collaboration is essential to achieving the optimal timeline to full-spectrum inclusive climate prosperity. Of great concern to millions of stakeholders is a recent report finding that the rough but regular dividing line between the arid west and the wetter east of the United States has migrated 140 miles to the east, over the past 100 years. That shift is actively degrading roughly 168,000 square miles of the most reliable farmland across six states from Texas to North Dakota. That’s 1/32 of all the arable land on Earth and 1.2 times the land area of Germany. Such degradation of vital natural resources undermines efficiencies across the entire economy of the world. This is why, as Kate Hampton of the Children’s Investment Fund Foundation noted, young people are demanding the judiciary address inaction on climate change as an issue of intergenerational justice. The science of climate attribution is now so good, she explained, civil lawsuits can now begin to serve as a new mode of accountability. The momentum now being seen in climate litigation marks a shift in structural market signals. Some planned investments will either have to shift or carry a higher cost than was projected. To future-proof an investment, a budget, or our ability to deliver what we owe to future generations, we need to price carbon; we can no longer let these costs filter out to society, invisibly, adding risk for everyone. Getting the price of carbon-emitting fuels in circulation right is not just about ending the threat of catastrophic climate change. It is also about avoiding the micro and macro-scale economic impacts that will flow from too many actors not responding to these signals. Mauricio Cárdenas, Colombia’s Finance Minister, connected these climate, legal and market signals to ecosystem protection and the building of peace in the post-war scenario. The right carbon pricing policy design allows for more efficient return on investment in sustainable development priorities, locally rooted peacebuilding initiatives, upgraded clean economy infrastructure, and a more competitive national economy. Brune Poirson, France’s Deputy Minister of Ecology and Inclusive Transition, noted that we are not yet on track to achieve the goals of the Paris Agreement. Smart carbon pricing, linked to the most effective complementary policies, can address just (inclusive) transition issues, to raise ambition and speed climate solutions. She pointed to the need to use revenues intelligently to ensure economic efficiency, environmental effectiveness, and new local value that ensures sustained political support. For the next One Planet Summit, she said, we should embrace a collective goal of being able to say that national climate action strategies are on track to meet the Paris Agreement goals. expands the everyday foundation for rising wages. An emphasis on carbon pricing policy design to building locally rooted economic leverage, at the human scale, can expand real disposable personal income, adding significant new investable opportunity to the whole economy. The work laid out in this year’s High-Level Assembly of the CPLC is critical to achieving the optimal transition pathway in all cities, regions, and nations. We view the complex work of aligning divergent carbon pricing strategies to link jurisdictions, with as simple and transparent a process as possible, as a way to speed the delivery of economy-wide national climate action strategies, in the spirit of the ‘We Are Still In’ coalition of states, cities, colleges, businesses, and other local actors across the United States. We are proud to be founding strategic partners in the CPLC, and we congratulate the Working Group leaders and Secretariat Team for their stewardship of this climate-smart future-building mission. We look forward to contributing technical insight, targeted guidance, opportunities for convening, and task team work for Carbon Pricing in the Americas. In partnership, we can build the climate-smart future people naturally expect we should. Joseph Robertson is Global Strategy Director for Citizens’ Climate Lobby, Founder and President of the Geoversiv Foundation, and lead strategist in the Resilience Intel climate-smart finance initiative. Older PostWhat makes the CPLC unique?